Congratulation to these 10 managers and thank you to all (more than 1000 – this is awesome) who participated in this betting game. We already orderer the 6 month supportership for wolsa2 and the 3 month supportership for bakan75 on hattrick and transfered the credits to all of these 10 managers. Next betting game will be 2014 FIFA World Cup in Brazil. We are looking forward to it and hope to see somebody else winning instead of Spain 😉 . … schmidde. Schmidde donated 5 EUR and win a coupon for a hattrick youthclub t-shirt. Congratulation schmidde. We want to thank everybody who participated. Maybe we will repeat this raffle later this year! P.S. : Have a look at the screenshot of your self-written tool, which we used to find the winner. Win a hattrick youthclub T-Shirt! Gewinne ein hattrick youthclub T-Shirt! We will raffle a voucher for a hattrick youthclub T-Shirt (worth 18.50€). You can participate from the 1st of June to the 15th of June. To participate donate at least 1 EUR (if you send us money in another currency, we will exchange it). 1 EUR = 1 lot. 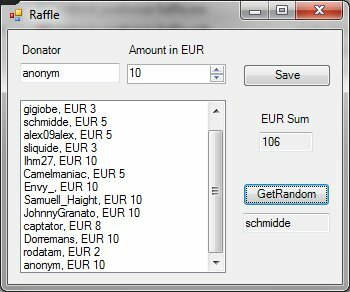 An Example: If you send us 10 EUR, we will put 10 lots with your name in our lottery wheel. We will draw the winner at the 16th of June. Good luck and thank you for supporting us! Wir verlosen ein Gutschein für ein hattrick youthclub T-Shirt (im Wert von 18.50€). Teilnehmen an der Verlosung kannst du in der Zeit vom 1. bis zum 16. Juni. Um teilzunehmen spende uns mindestens 1 EUR (solltest du in einer anderen Währung uns das Geld senden, tauschen wir es in Euro um). 1 EUR = 1 Los. Ein Beispiel: Wenn du uns 10 EUR spendest, kommen 10 Lose mit deinem Namen in unsere Lostrommel. Wir ziehen den Gewinner am 16. Juni.